If you are android users and searching for how to update apps on Android, then you are on the right page. Now in this article, we are providing you complete details on how to update apps on android (automatic and manual). Here we provide steps to update apps on android. As there are many platforms, but Android is one of the best platforms used by many billions of people. For anyone who is looking for a reliable smartphone, the android device is the best choice. The Android platform has many interesting features. You can get millions of apps and games on your android devices. There are apps available for anything. There are apps like office apps, music apps, cooking apps, game apps and much more. Any app can be downloaded for your smartphone from Google play store. Some apps are available for free and some apps are available for paid. You can update apps in 2ways. Update android apps manually and automatically. The apps on your android phone will be updated automatically when you are connected to the internet. In certain situations, it is not applicable. You have to enable auto-update settings. Here we are providing steps to update android apps automatically via Google Play Store. Select the three horizontal lines. Now click on the Auto-update apps. By following these above steps you are allowing the Google play store to update the apps at anytime either through Wi-Fi or cellular data. The best option to update your apps is auto-update apps over Wi-Fi only. The apps can be updated manually at once by gong to My Apps section and select update all. Here we are providing steps to update android apps manually. Open Google Play Store service. Then select on My Apps. On installed tab select the app and click on update all or choose the individual app and click update. That’s all about how to update android apps manually and automatically on Google play store. Follow these simple steps and update all your apps. If your Wi-Fi connection and data are fast it will take less time to update all your apps. Now we are providing some simple steps to update android apps via computer PC. First, download Moborobo and install on your PC. Now Enable USB Debugging, by going to Settings > Developer option > check or enable “USB debugging” before you connect to the PC. Open Moborobo, you can see your smartphone connected with its internal & external storage details. If it doesn’t, you have to update the drivers on your desktop, to do so just Google your smartphone model followed by drivers. Now tap on the Apps tab. Select the App update on the left-hand side. So, by following these steps you have updated your smartphone apps and games using your PC. 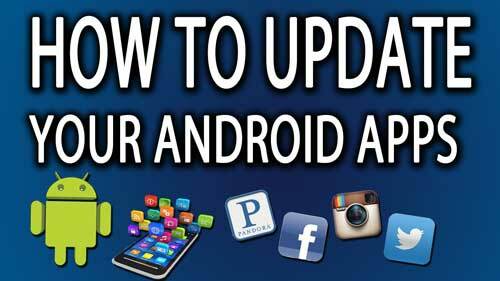 This is all about how to update android apps automatically and manually. If you have any queries regarding this article please do comment below we will reach you as soon as. Thank you for visiting our site @ www.dreamaim.com.